A friend of mine recently had the amazing chutzpah to pick up the phone and call Gene Kranz, retired NASA flight director and one of the heroes of the Apollo 13 rescue. He very nearly got hung up on. But somehow, amazingly, Kranz stayed with him and they ended up having an actual conversation about NASA yesterday and today. Since then they’ve been e-mailing back and forth. Here’s an excerpt of their correspondence. Good afternoon. This is the guy that called your home and blabbered at you a few weeks ago. So a question: whether youre in a flat spin or at console getting a 1201 with 30 secs left, what goes through your mind? Is there something you go to down deep besides keeping your eye on the ball? A saying? Or is it pure focus and training? In crisis mode I depend on my training to get me through the first few minutes then revert to a checklist that I developed in early spaceflight and during training. See the attached. It was the key to getting through the first hour of Apollo XIII. I love the use of present tense — “In crisis mode I depend on …” — suggesting that he reacts similarly to household crises in his retirement. Now, I’m not a director of space missions (though god knows I should be), but I’m going to try using this checklist next time one of my projects runs into trouble. Perhaps tomorrow? Will let you know how it goes. China launched its second manned spaceflight today. The Shenzhou VI capsule carried two astroanauts (taikonaut is the word used previously, though I’m not seeing it employed this time around) and much-improved living quarters into orbit a few hours ago for a 5-7 day trip around the Earth. A module attached to the capsule itself will be left in space, presumably as some kind of remote-controlled lab, but details are vague. Vagueness is typical of the Chinese space program, but my colleagues in Beijing confirm that the launch itself was a big news event, broadcast live on state TV. That’s progress. The first launch — like the first Soviet launches so long ago — was kept a secret until the capsule was safely in orbit. A light snow was falling at liftoff, reports say. I’d like to see a picture of that. There’s something about a light blanketting of snow preceding the cataclysm of a rocket launch that’s pleasantly odd, almost like a Photoshopped image. One wonders if this launch was actually delayed since last week the People’s Republic celebrated National Day and a launch event, source of such national pride, would have made sense then. If it was delayed this is a good sign that China has their launch priorities in line. Perhaps they’ve learned from the close-calls the early Soviet space program had in trying to launch in conjunction with politically-significant events. The long march to the moon continues. Tom Hanks has a thing about the Apollo program. I suppose you could say I do too. I’ve been interested in NASA and spaceflight since I was young, but what really what set me on my current path of obsession was the Hanks-produced and -introduced HBO mini-series From The Earth To The Moon from 1998. It was extraordinary television, dramatic and intelligent. Only after that did I dive into Apollo 13 in earnest. It was one of the first DVD’s I ever owned and it still is the benchmark with which I test new AV gear at home. (Pay attention to the surround sound field as the camera pans along the fuel pipes just before liftoff.) I treated Apollo 13 as a kind of alternate chapter to From The Earth To The Moon, even though the film preceded the mini-series by three years. So, Hanks is back at it with Magnificent Desolation: Walking on the Moon 3D, an IMAX 3D short film. Like most IMAX it is a temporary fun, not exactly satisfying after the fact. Add in the 3D glasses — something I have not worn since Jaws 3D in the 1980’s I’m pretty sure — and you have enough gimmicks to truly stack the deck against the show. You really can’t tell the story of Apollo in 55 minutes and you certainly don’t have elbow room for narrative arcs so what Magnificent Desolation aims for is merely to make you feel like you are walking on the moon. This it achieves. My four-year-old was reaching out to grab the moondust that was kicked out into the audience via 3D. The best effect was the now-typical pan way out (ala Titanic) from the lander to a very broad shot of just how alone the astronauts actually were, not a shot that any Apollo-era photo could ever provide. The only aspect of drama in the whole thing was a play off this loneliness where they enacted an emergency scenario, thankfully never used in six moon landings, where the astronauts were stranded after a rover malfunction kilometers from the lander. One of the astronaut’s oxygen was low and they had to hoof it back to home so they buddy-breathed their way back to spacecraft. It was very well done, but the whole time I was thinking that when we do go back to the moon (and by “we” I guess I mean the Chinese) it will be a hell of a lot easier to fake a moon landing than Capricorn One. We won’t even need O.J. Simpson. In the end it was satisfying, but only in the way that an amusement park ride is. Cheap thrill, go home, forget about it — except to blog it. The show interspersed a bunch of actual footage of the landings, but because of the resolution difference — 1960’s-era film versus six stories of IMAX screen — meant that the footage was shown picture-in-picture as a small overlay. This will be the fate of so much pre-HD footage in the future, jarring you out of the experience merely because the effect is so low-res. Magnifcent Desolation had a bit of an agenda too. They interviewed kids to see what they knew, mostly focusing on what they didn’t, about the Apollo program. One child, a young latina, said she’d love to go to the moon. Her story and her crayon drawing of how she would get there was dramatized at the very end in a future scenario where said child was the commander of an extensive moon base, making ample reference to the fact that humans have not stepped foot on our satellite in over thirty years. It won’t change the fact that there is no public will to do this any time soon, but it was powerful nonetheless. So, I recommend this if you can see it in an IMAX theater. If not, the DVD will underwhelm. Sorta like saying, if you can buy a ride to orbit, do it. Otherwise, wait for the movie. Maciej Ceglowski has written an oustanding piece on what’s wrong with the US manned space program. No argument here. But NASA dismisses such helpful suggetions [about discontinuing manned space altogether] as unworthy of its mission of ‘exploration’, likening critics of manned space flight to those Europeans in the 1500’s who would have cancelled the great voyages of discovery rather than face the loss of one more ship. A couple of thoughts on the emergency repair of the shuttle tile fillers that will take place soon. This kind of unrehearsed response to a potential calamity is precisely the kind of thing we need to be comfortable with if we are ever going to leave Earth orbit again or go to Mars. So, on the one hand, I feel that there is a bit of overreaction from NASA at play here — that filler fabric has come undone thousands of times before and it was not the result of any impact at launch. But this could also be a sign of a new risk-tolerant NASA, the “old” NASA so to say. Not a NASA that accepts risk cavalierly but one that has confidence that a task that has not been dissected from every angle and rehearsed for months might still be worth the effort. Jim Lovell (of Apollo 8 and 13 fame) has suggested that one of the problems with NASA post-Challenger has been a reluctance to embrace the unknown, to push boundaries where the risk seemed worthwhile. Certainly NASA has attempted first-of-a-kinds since Challenger, but this statement rings true. 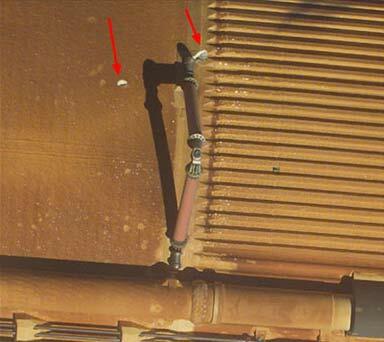 Conducting this ad hoc repair is a good thing for NASA’s confidence, even if not 100% necessary. Atlantis is already mated to its own external tank-solid rocket booster launch stack, and was slated for a Sept. 9 liftoff before today’s foam find. NASA also tapped Atlantis to serve as a rescue ship for the STS-114 crew in the remote chance Discovery was too damaged to return home and its astronauts forced to take shelter aboard the space station. 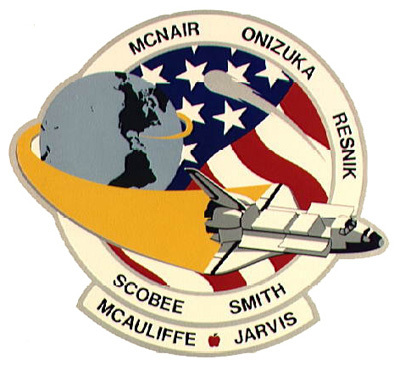 That contingency rescue mission is known as STS-300. No one is faulting NASA for reacting with such care to the news that foam insulation did in fact shake loose during launch. The images of the divots and missing patches are eerie reminders of Columbia, scars of an ignorance we thought we’d overcome. But one has to wonder if the dozens of new cameras trained on the shuttle during ascent is making the problem seem worse than it is. Stuff shakes loose in the tug-o-war with gravity. Always has. In whatever we build to fly us to space next we need to attempt to prevent debris and harden whatever critical surfaces might be compromised by that debris. [*] This kind of protection was not added in the post-Columbia changes, to my knowledge. The clock is ticking on the shuttle transportation system. My bet, we won’t make 2010. Re-entry is going to be tense. [*] The heat shield on the Apollo capsule was safely sheathed until very close to the beginning of re-entry, for example. I’ve been known to bad-mouth the shuttle in these parts — mostly a tough love thing — but I gotta admit that I got a little choked up to see it leap off the pad this morning. Bravo, NASA. Eileen Collins and the crew had what looked like a flawless ascent. CNN noted that her voice before the solid boosters peeled off was shaky, but c’mon she’s on top of 6.6 million pounds of thrust. Like trying to have a phone conversation sitting on the roof of a locomotive. NASA’s launch announcer always has a brief prepared tag line right when the countdown goes from minus to plus. This time he said “… beginning America’s new journey to the Moon, Mars, and beyond.” This is interesting because none of that journey involves the shuttle. NASA is looking forward, so much so that they used the return to space of the shuttle to reaffirm its retirement. I like this. 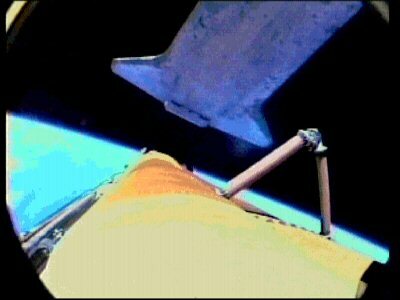 And the camera on the external tank! I’ve seen other launches from this angle, but never from the shuttle. That was damn cool. I’m scrounging for footage of the separation of the tank from the orbiter — something no one had ever seen previously. Amazing how smooth that was and to see the orbiter engines direct it to orbit. No word on the fuel sensor gauge, but, as a friend who had a flaky gauge on his Wagoneer noted, the key is just to jot down your mileage as you tank up. Isn’t that what mission specialists are for? The day after NASA scrubbed its return to space China announced that Shenzhou VI, its second manned flight, would go into orbit in October. China Daily reports that the announcement came on the occasion of the handover of a meteorological satellite from its maker to the Chinese government. Let’s call it what it was, though. They’re rubbing it in NASA’s face! Keeping with the China and excrement theme, Shenzhou VI will apparently contain a new toilet. Useful, since there’ll be two taikonauts this time. By the way, there’s an official bottled water of Chinese taikonauts. Can you even imagine such a thing in America nowadays? Gotta admit I was selfishly pleased to see the launch scrubbed. It ain’t easy catching a mid-afternoon launch when you are Houston +13. That fuel sensor problem really seems like the undead issue. Can’t kill it. I bet the commander, Eileen Collins, had deja vu when the window cover fell off on the launch pad — and not because of the falling foam that doomed Columbia. Collins had her foot on the gas for the scariest ride up in recent shuttle history, STS-93, when three cooling lines were ruptured by a falling pin during main engine ignition. Collins and her crew ended up short of their orbit, but the mission was a success. I’m pretty sure NASA had this in mind when they selected her for the program’s return to flight. She’s apparently quite cool under pressure. I really wish NASA had a shuttle alternative in the functional prototype phase in the next year or so. By my calculations, even if the shuttle makes it to the 2010 mothballing date there will be several years — akin to the post-Skylab pre-shuttle era — where the US has no operational manned space vehicle program. Ironic that that the two bright areas in manned spaceflight are private industry and communist China. What an odd space race. Sidenote: You can get uncluttered live video and often telemetry data from United Space Alliance, the contractors who provide many of the ground operations to NASA. Sidenote II: Does anyone know of any good space blogs? Why can’t I find this?